Though you also get a sample, maybe two if you’re lucky when you buy perfume or Make-up at Douglas, etc. 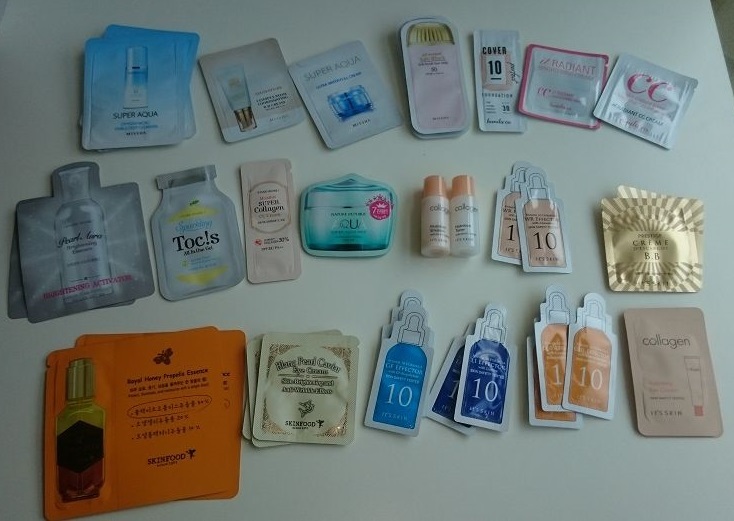 I never expected to get so many samples from Korea. It just seems to be the way it’s done in Korea, according to this video and article from Eatyourkimchi. 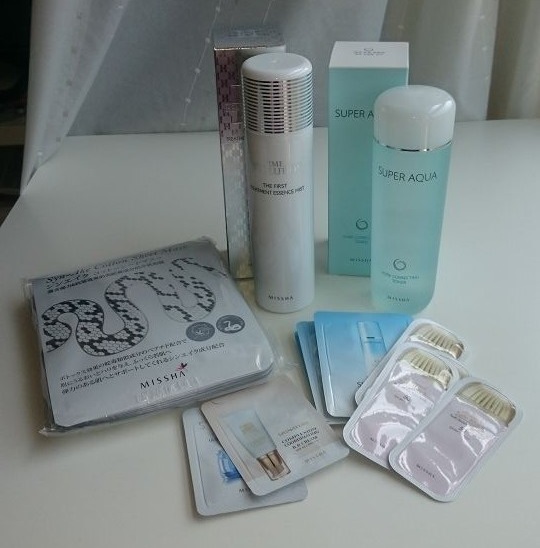 I do love me some samples; they are a great way to test out other products and there were quite some samples for serums/ampoules. I’ll definitely try those out over time. But let’s get to the next step and have a look at the morning and evening routine line-up. Because I took the pictures this way I’ll show you everything according to the brand I got them from, starting with Skinfood. Skinfood, as the name already says, makes skin care products with a focus on natural ingredients. On their website you can actually choose your product according to the “fresh” ingredient, like Lettuce, Apples, Black Sugar or Avocado. 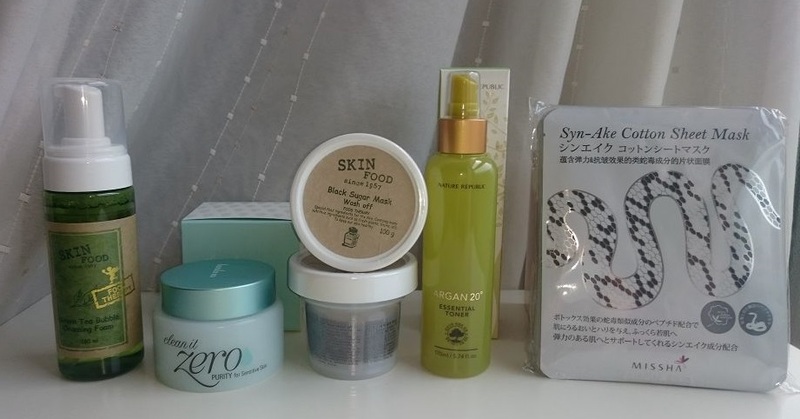 What my husband brought back from my list are sets of The Black Sugar Mask and Green Tea Bubble Cleansing Foam. The Black Sugar Mask is something I have used before and it is really great. The smell is awesome and after massaging in the mask and letting it sit on your face for 15 minutes and washing it off, your skin is so smooth and soft. But, I think I like the Green Tea Cleanser even more. So glad my hubby brought back a set. The foam is so soft and feels amazing on my skin, combined with the green tee smell it makes for a very enjoyable task. Next up is Banila. While researching which products might be best suited for my skin for a Korean beauty program I read about the Banila Clean it Zero. It seemed to be the best choice for an oil based Cleanser and I am very pleased with it so far. I haven’t used an oil based cleanser before so it takes some time to get used to it, but the way it practically melts off my make-up I’m pretty impressed. The Primer came in a two piece set with the Good Night Finish Mask and it is very good under make-up, or for me, even under BB cream to avoid dry patches and make everything silky smooth and even. The Good Night Finish Mask is, as the name says, a night mask or night cream which is supposed to give a protective layer to all the products you applied before, so they can really sink in over night. It’s actually amazing how little of the cream you need for a full coverage and I think this one will probably outlast everything else. 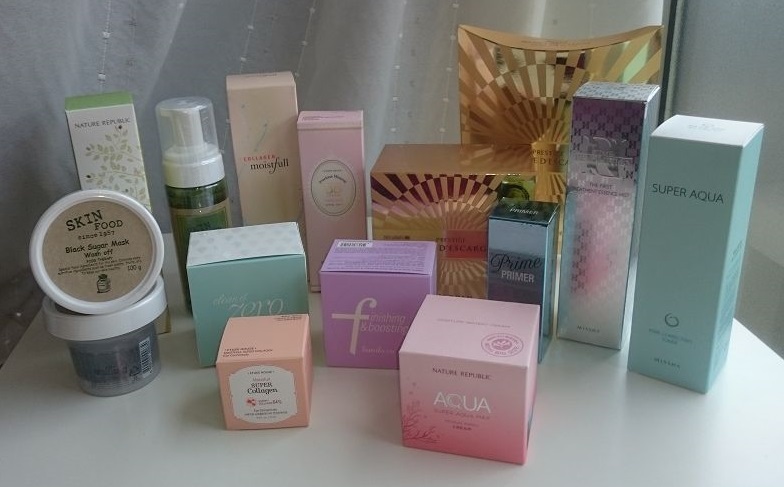 Missha advanced to one of the most popular brands from Korea and build quite a reputation overseas. 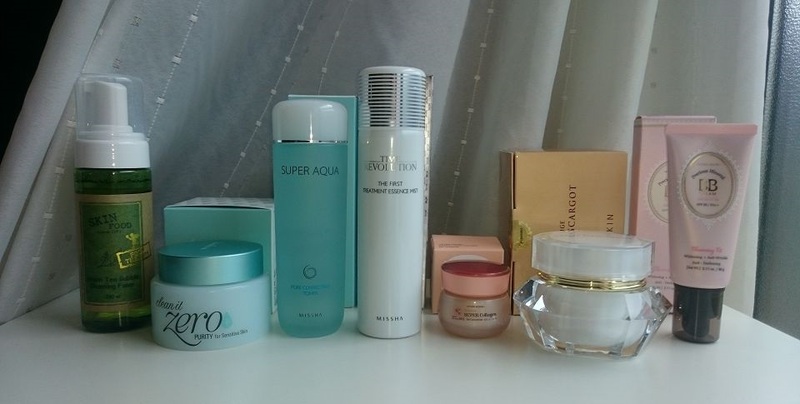 I use the Super Aqua Pore Correcting Toner in the morning and it fast became a favorite of mine. Toner just makes you feel all fresh and new and this is the best one yet. We already found it here in Japan as well, and it’s not even more expensive, so this will definitely be in my routine for a long time. The Time Revolution The First Treatment Essence Mist is the next step in the Routine and sprays a very fine mist, which should be patted in, to prep for the following moisturizing products. The Syn-Ake Cotton Sheet Masks are ones I use two times a week in my evening routine. They are a folded whole face masks that you just let sit for 15 to 20 minutes and then toss. 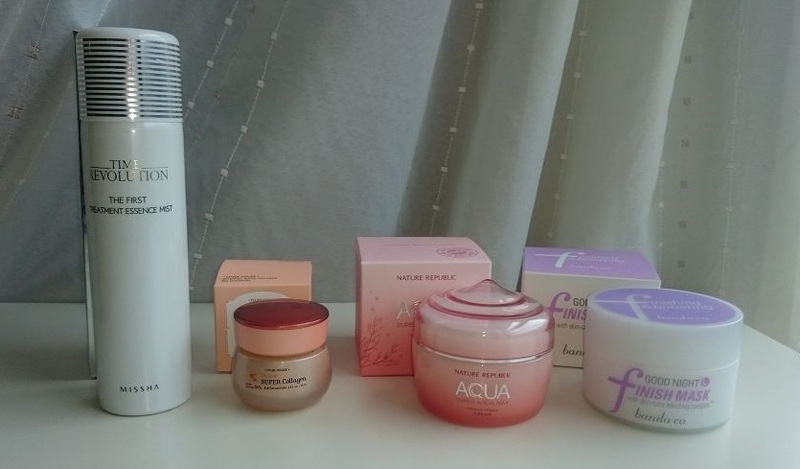 Next on the list is Etude House. Known to be one of the cheaper cosmetic brands (quite similar to Missha) it has still a good reputation, especially for its BB cream. The Precious Mineral BB Cream Blooming Fit was the main reason I send my husband to etude house because it seemed to be the best fit for a first try BB Cream. The coverage of the Cream is good, but on the lighter side. For everyday I wanted something that doesn’t give me the feeling of having heavy make-up on and this one is just the right consistency. Something I am dreading here in the summer is the air conditioning, because it makes my eyes so dry and itchy, it’s hard to not start rubbing at them until they’re red. Hopefully the Moistfull Super Collagen Eye Concentrate will help me this summer and so far it’s doing a good job. In the beginning I think it was a bit much compared to the “nothing” I did before and I really felt the skin tingle when I put it on. But it seems my skin got to a healthy level of moisture and now it feels just as putting moisturizer on should be. The Collagen Moistfull Emulsion is another moisturizer so I decided to pack this one away for a later date when one of my moisturizers is empty. 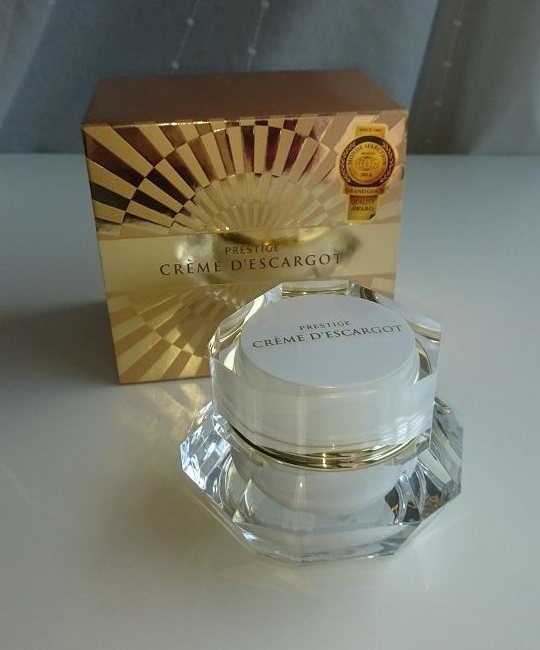 After the eye cream comes the moisturizer and in the morning I am using a quite luxurious cream from It’s skin. The Prestige Créme D’Escargot is definitely the most expensive item in this line-up, but it is also one of my definite favorites. Anyone speaking french has already guessed what’s in it, as Escargot means “snail”. For quite some time the snail creams and masks have been popular for their ability to heal cuts and bruises faster and make the skin look tighter and younger all around. I was a little unsure what to think of it and to be honest, this wasn’t on my list, but was an extra from my husband. But after the first use I was hooked. The smell is very pleasant and somehow makes me a bit nostalgic, I think it reminds me of a cream my grandma used. The feel on the skin is even better; the cream absorbs quickly but leaves a soft and smooth feeling. 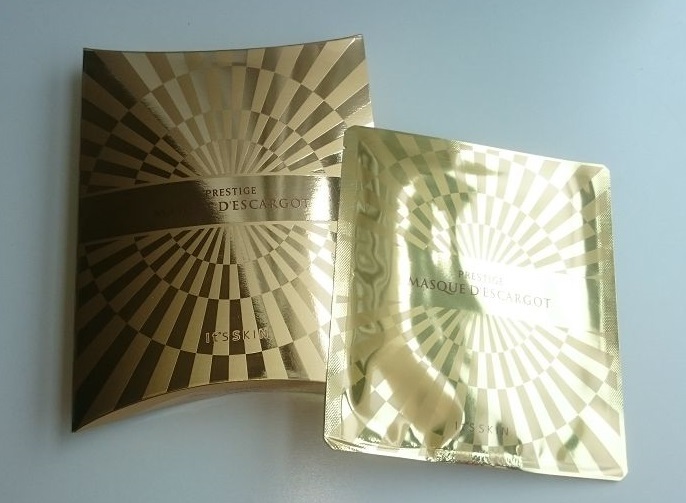 The Prestige Masque D’Escargot are basically the same, just as a deep moisturizing mask. They are not cotton sheet masks but rather silicone masks that cling to your face like a second skin. They are separated for the upper and lower half of the face for a better application. But as they are nearly as expensive as the cream I think I will use them sparsely ^^” Also, if possible these make me look even more than a serial killer than the “normal” white ones. 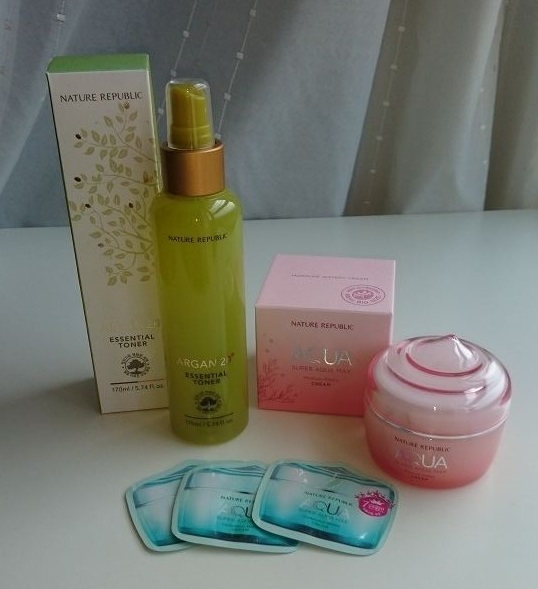 In the Evening I change the Missha Toner for the Argan 20° Essential Toner from Nature Republic. This brand has also quite a lot of organic products and I think the Toner is very good for sensitive skin, as it is very gentle. You might be able to guess that the Aqua Super Aqua Max Moisture Watery Cream is a moisturizer 😉 I have to say, the extent of the “water” use in it’s name really does reflect in the cream itself. It has a gel like texture and feel quite heavy on first impact, but it is easy to spread and absorbs rather quickly. Because you don’t need that much I think it’s one of the creams that will last the longest. Besides all those products above I also use the Kosé Suncut UV Protect Spray SPF50+ PA++++ this summer. Although the BB Cream and also some of the moisturizers have SPF the intense sun here managed to burn my face nonetheless. Not from Korea, but a Japanese product the Spray is actually quite nice to use. Absorbs really quick and is easy to apply. Well, I hope you enjoyed to read a bit more about my skin care program 🙂 Please let me know if you have any questions. I was considering if I should add links and prices for the products? But maybe it might be easier to search for the products in local online shops? I have that BB cream! 🙂 It was the first one I tried and so far it’s working out oretty well.. but I still want to try some other ones too. I really need to get into a skincare routine, so I might try some of the ones you like. Did you see that on the one Martina did? Cause I considered trying that one for a bit more coverage. Sometimes I find the Blooming Fit one doesn’t even make a difference lol. 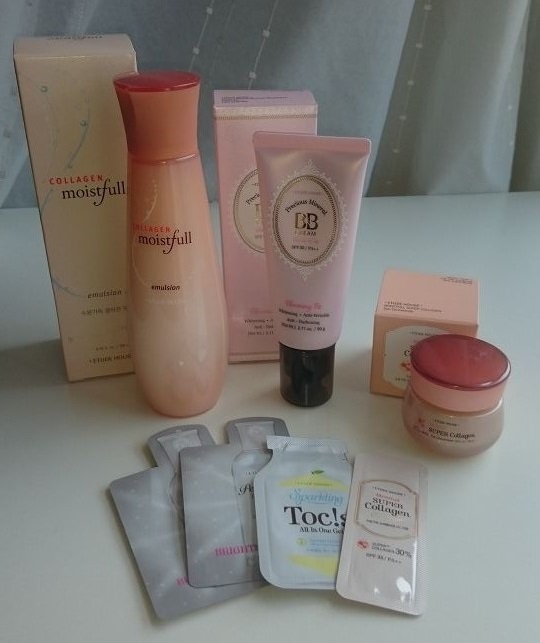 Yes ^^ I saw it there first but had already decided to try the Etude house one so I stuck to it. For me the blooming fit is nice to get a “no-make-up” natural feeling, but I agree it has its limitations with redness and zits.